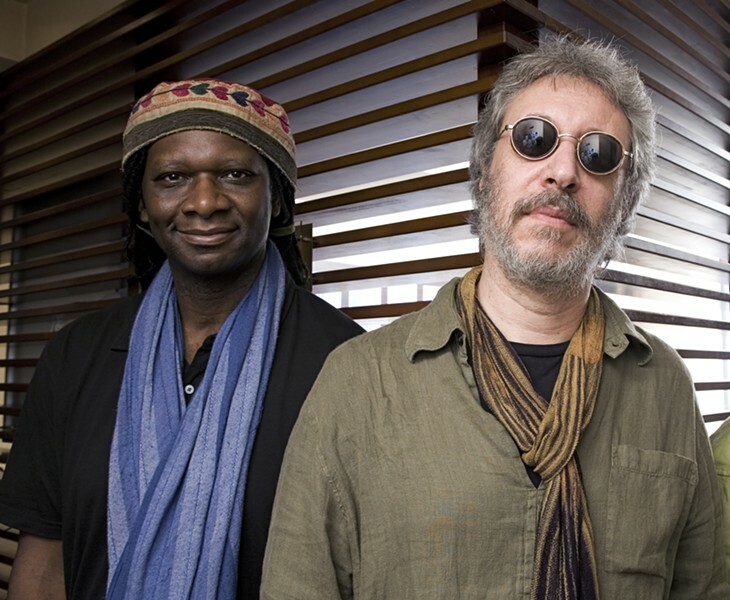 PHOTO BY HIROSHI TAKAOKA Hamid Drake (left) and Adam Rudolph (right) will perform together as Karuna at the Bop Shop on Saturday, May 5. The names at the top of DownBeat Magazine's Critics Poll are constantly changing in most categories from year to year. But, in recent years, one name has been stuck at the top in the percussion category: Hamid Drake. Whether he's playing a hand drum or a full set, Drake's dexterity, subtlety, and precision are aurally and visually thrilling. Over the decades, Drake has lent his talents to Pharoah Sanders, Archie Shepp, Herbie Hancock, Wayne Shorter, Yusef Lateef, and dozens more. He is especially well known for his work with cutting-edge, improvisational groups. A master of African and Indian rhythms, reggae and Latin beats, and much more, Drake will be appearing in Karuna, a duo with another top percussionist and long-time collaborator, Adam Rudolph, at the Bop Shop on Saturday. As the Bop Shop celebrates 30 years of concerts, it's especially appropriate to have Drake playing. In 1988 he was a member of the Pierre Dørge Quartet, the first group to appear at the Bop Shop. Growing up in Chicago, Drake got into percussion by accident when, in grade school, he wanted to play in the stage band. He had his eye on the trombone section, but there weren't any trombones left. The only open slots were playing the bass and snare drums, so Drake reluctantly signed on. "At first I didn't like it too much but as time went on a love affair occurred between the drums and myself," Drake says. "Years after that, studying different percussive traditions from other parts of the world, the flame was fanned even more. "I began realizing that the drum was one of the first instruments outside of the voice and the flute, and there were so many amazing drumming traditions throughout the planet, from India to Africa to Asia to Europe and so on." His skills have taken him all over the world, but Drake still lives in his hometown, a fertile ground for musicians. Chicago is well known for organizations like The Association for the Advancement of Creative Musicians and progressive groups like the Art Ensemble of Chicago. "Chicago is one of the centers of the improvised music world," Drake says. "There are a lot of artist- and musician-operated things here. It's a little less competitive than New York and the cost of living is better." Drake also says he feels lucky to have grown up in the late 1960's and early 1970's. "It was an amazing time socially and politically," he says, "and the music and the arts in general played a role in elevating political and social, even spiritual and religious consciousness." Drake came of age playing rock 'n' roll and R&B in garage bands. As a teenager he admired drummers like Zigaboo Modeliste of The Meters; Bernard Purdie, who played with soul greats like Aretha Franklin; and Al Jackson Jr., Al Green's drummer. He was fascinated by big band drummers and jazz drummers like Shelly Manne, but he also admired the way The Band's Levon Helm could play and sing at the same time. He feels fortunate to have come along at a time when there was a lot of experimentation going on in everything from folk music to jazz and was enamored of innovators like Ornette Coleman. Drake's horizons were expanded at Rose's Records, a Chicago store with an extensive international section and listening booths where he could sample the records. "At first I became very attracted by the covers," Drake says, "and then you start listening and it's something you've never heard before. So you buy it and take it home and check it out, and after a while it becomes part of your musical DNA. It starts to affect you in an unconscious way. "Then you start to consciously explore as far as playing these instruments and discover similarities and differences. Then you wonder, how can I incorporate this into what I do, still maintaining the integrity of the tradition but also making it my own? My curiosity just got piqued." Drake used to collect drums in his travels but space got tight. He's currently interested in frame drums -- wooden hoops with skin draped over them -- from different cultures. He's acquired Turkish, Moroccan, Egyptian, Irish, Scottish, and Inuit drums and various tambourines. When Drake plays with Rudolph in Karuna (the word means compassion in Buddhism), it looks and sounds like two men having a conversation, only they're communicating with drums. That doesn't surprise Drake. "It's just an extension of the conversations we have all the time," says Drake. "We have a lot of philosophical discussions so when we get behind our instruments it's just a continuation." Drake and Rudolph met at Frank's drum shop in Chicago and started playing together when both were 14 years old. "We came up studying some of the same drumming traditions," Drake says. The two musicians played together in Mandingo Griot Society, the first group in the West to use the Kora, a West African 21-string lute-bridge-harp, "and connect it with all of the African traditions that were part of the diaspora: R&B, reggae, funk, and stuff like that." Now a leading proponent of drumming traditions, Drake feels fortunate and blessed to be able to make a living through the art of percussion. "You find it all over the world, so if I can be associated with that I'm grateful," he says. "There's a great Native American chief who said the drum is the heartbeat of the universe. That can be taken on many levels. The number one drum that all creatures have is the heart. The heartbeat is the drum that continues to play and when it stops playing, that's it."